My mother has big plans for her garden. And these plans, perhaps inevitably, involve a fair amount of digging, heavy lifting and general gorilla work. Which, perhaps even more inevitably, is where I come in. And so we found ourselves spending a tiring – but ultimately rather enjoyable – weekend tearing up a small portion of Somerset. There had, at some point in the distant past, been a master plan for the design of the new garden. However, initial discussions upon our arrival at cup-of-tea time on Saturday morning (you have to admire my timing) identified that this plan had moved along somewhat. And so, while Natalie and my mother started clearing the vegetation from a long border running the length of the garden, I grabbed a spade and got to work clearing the turf from a small area of lawn. My task was to remove the lawn, dig over the soil and create some low beds for flowers, vegetables and such like. There were a couple of existing beds on either side of the lawn, which had been used as compost heaps and so were somewhat uneven and full of roots, but after a couple of hours I was left with a vaguely flat, almost root free expanse of soil. You’ll note that Molly is taking her role as general assistant extremely seriously. Here, she’s clearly checking the level of the paths. 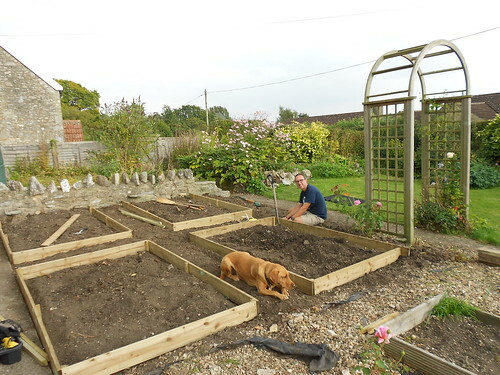 After we’d finished the edging for the beds, Natalie and I put down some weed-suppressing membrane over the paths. Molly thought the membrane was brilliant and promptly settled in for a snooze. She wasn’t so happy when we started tipping gravel on top of it, though, and relocated to one of the raised beds, instead. We also used this weekend as an opportunity to try out our new tent. 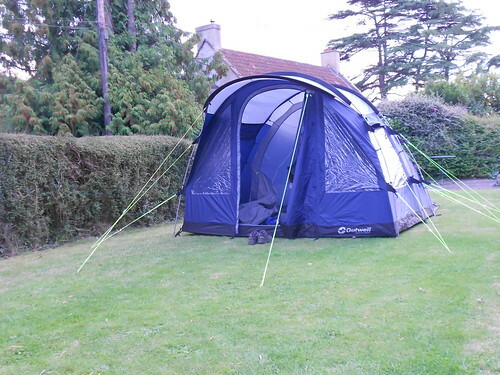 * As you can see in the photo below, it’s a proper ‘grown up’ tent (I’m used to small, lightweight things for hiking expeditions) with a separate ‘bedroom’ and windows. Yes, windows. We were intrigued as to how Molly would cope with sleeping outside, so my mother’s garden seemed a good place to start. After all, if Molly barked all night, then it wasn’t our neighbours that we were upsetting. It turned out, though, that Molly was absolutely fine with the whole camping thing. I laid out her mat in the corner of the tent and indicated that she should sleep there. She promptly ignored me and clambered into the small gap between my and Natalie’s sleeping bags, where she burrowed herself a nest, sighed deeply and went to sleep. Well, I guess it’s our fault for sleeping on the ground, which is usually her domain. And Molly does make an excellent hot water bottle. * My mother would, I am sure, like me to point out that she did offer us a bedroom in the house. We weren’t forced to sleep in the garden. This entry was posted in Dogs, Family, Gardening and tagged Camping, Dogs, Family, Gardening, Molly by Simon Perks. Bookmark the permalink.